In what is being termed as Indian telecom industry’s first such tariff rates, Uninor has introduced low cost service based Internet plans starting from 0.50 paisa per hour. Branded as ‘Sabse Sasta Facebook’ and ‘Sabse Sasta Whatsapp’, Uninor is targeting popular applications such as Facebook and WhatsApp, Uninor plans to double it’s data revenues and users by the end of 2014. 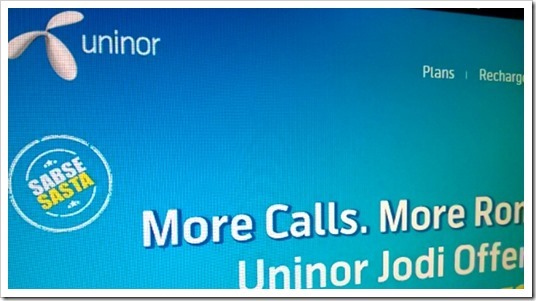 Uninor is Norway based Telenor Group’s Indian subsidiary, having corporate office in Gurgaon. They have recently rechristened themselves as Telewings Communications, with Telenor having 74% stake. They offer GSM based voice and data services, serving around 3 crore users in Uttar Pradesh, Uttarkhand, Bihar, Jharkhand, Maharashtra, Goa, Gujarat and Andhra Pradesh. Under this new service based Internet plans, Uninor is offering fixed hourly based plans instead of MB and GB based volume based usage plans that are currently the norm among telecom operators. For example, users can choose Facebook usage for an hour by paying only 50 paisa which a full day’s cost would be Re 1. Similarly, WhatsApp usage for a day will cost Re 1 and for a week it will cost just Rs 5. This will certainly appeal to those who are not heavy users of Internet, and only spend time on certain applications. As per the company, such service based fixed hourly plans can save the user 50-60% of monthly expense on mobile data usage. Morten Karlsen Sorby, Uninor’s nominated CEO, said in a statement, “Internet is the way in which customers consume data and our approach will be to make that usage the cheapest among all operators,”. He added, “Selling internet as rupees per MB is like selling air or train tickets as rupees per kilometer. Customers use internet for services like Facebook or WhatsApp. Our plan is to make these services the cheapest on Uninor”. This plan has been launched in Gujarat as of now, and will soon be expanded to Maharashtra and Goa; the circles where Uninor has witnessed maximum data usage. In recent times, many Telco’s are moving towards fixed time based unlimited plans rather than more complex volume (GB, MB) based plans. Idea, Vodafone and Airtel had recently joined hands with Opera to offer their “Web Pass” solution that makes it easy for users to subscribe and use fixed time based plans.